An organization of 28 public and private schools, colleges and universities dedicated to increasing the enrollment of international students in Hawaiʻi along with the Department of Business, Economic Development and Tourism (DBEDT) and the Study Hawaiʻi Educational Consortium, announces a press and media tour of six journalists from Asia, Europe and South AmericaThe tour will take place during the week of Nov. 12 to 18, during International Education Week. Journalists from Ei! Magazine by Belta of Brazil; EL Gazette and PIE News of the UK; Ryugaku Journal and Mainichi Newspapers of Japan; and Studying Abroad Online China will participate in the mission. In honor of International Education Week, Gov. David Ige will sign a proclamation to recognize the contributions of foreign students to Hawaiʻi’s economy and culture. The signing will take place on Nov.14, in the Ceremonial Room, Governor’s Office, Hawai‘i State Capitol. According to DBEDT’s 2017 Hawaiʻi International Education Survey, Hawaiʻi hosted 10,800 students from 27 institutions during the 2016-17 academic year, down from 12,200 students from 31 institutions during the 2015-16 academic year. The total direct economic financial impact of international students for the State of Hawaiʻi was an estimated $225.3 million in 2016-17, down from $302 million in 2015-16. The group will visit various sites including Kapiolani Community College’s Culinary Institute of the Pacific, Iolani School for presentations by Study Hawaiʻi member institutions, Coconut Island Marine Research facility, MidPacific Institute, the University of Hawaiʻi at Mānoa, Hawaiʻi Pacific University, UH Maui College, the Institute for Astronomy at Haleakalā, the University of Hawaiʻi at Hilo, Hawaiʻi Prep Academy and Hawaiʻi Community College. DBEDT recently established the Study Hawaiʻi Ambassador Program, which is estimated to host to more than 25,000 students for school excursions and other education-related travel from Japan, China, Taiwan and Korea. As a result, the students become well aware of the various educational offerings and institutions available in Hawaiʻi. 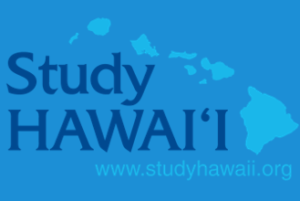 More information about Study Hawaiʻi may be found at www.studyhawaii.org. The “Economic Impact of International Students in Hawaiʻi – 2017 Update” may be downloaded here.